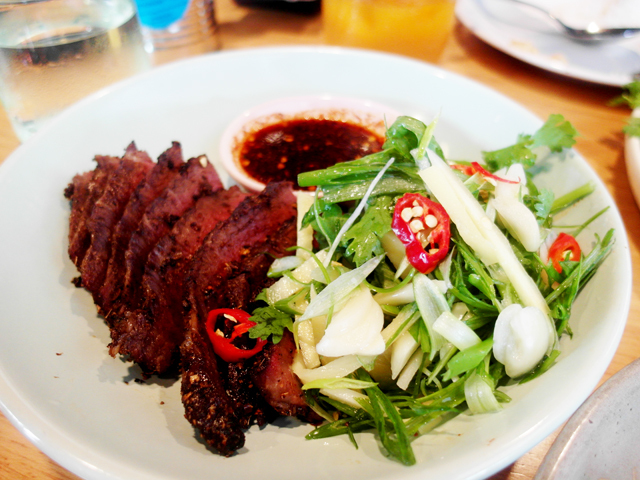 Awhile back, I visited Soi 60 at Robertson Quay for lunch with bf and Alvin, and was so impressed with the food! I generally like Thai food alot, but tend to always order the same few common dishes. Glad we ventured out of our comfort zone this time and tried some different Thai food! 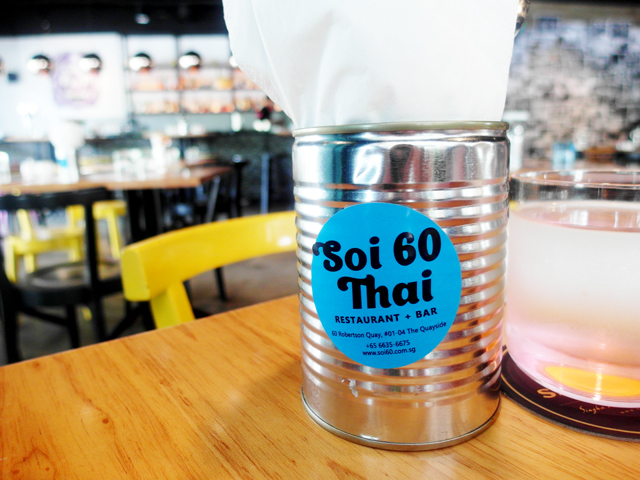 Soi 60 is a spacious and contemporary restaurant, a stark difference from most Thai eateries that tend to have traditional decor instead. 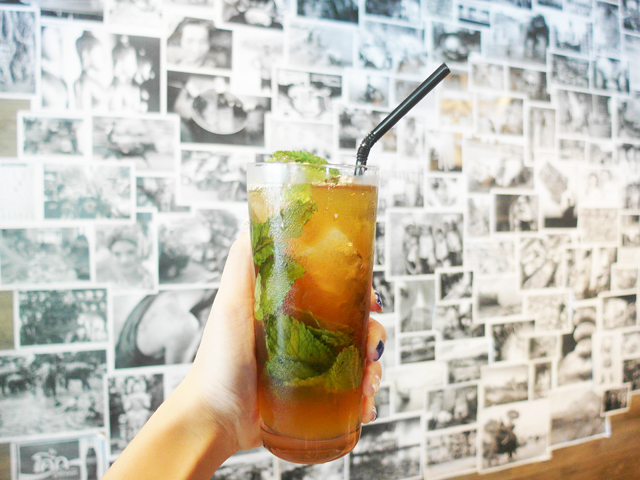 I liked the Peach and Mint Tea! Halfway through my meal I spilled the entire cup on myself. So embarrassing! But it was so good that I ordered one more because I was very sad about having only 1/3 cup left after everything else landed on my dress! 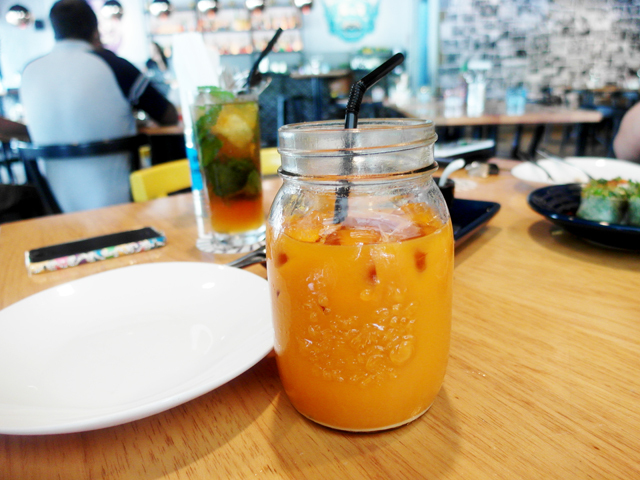 They ordered the traditional Thai Iced Tea. For starters, we had the Crispy Duck Pancake, which also has Lychee inside. What a unique combination, but it went well together. 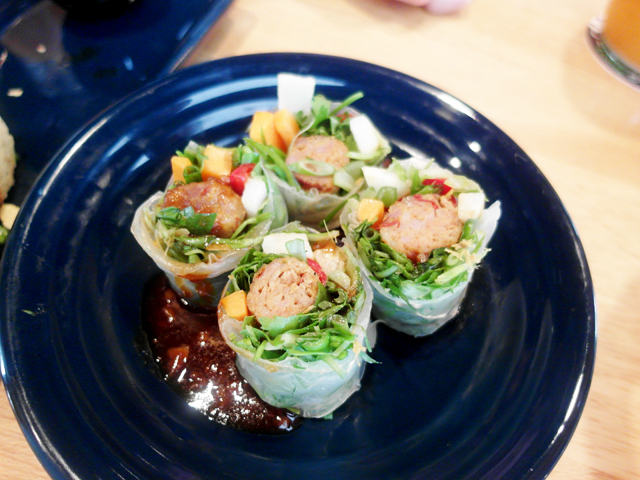 The thai herbs in these spring rolls we had next, were extremely fresh and fragrant and the pairing of sausage inside is a juxtaposition of tradition and modern. I was quite surprised that I actually like this dish because I don't usually like spring rolls full of vegetables. 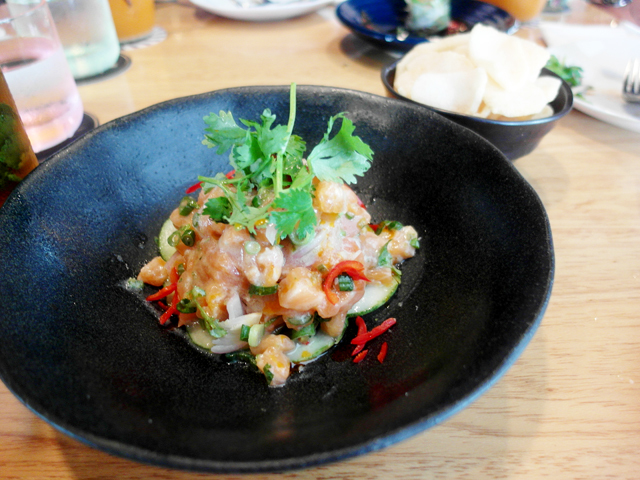 The Salmon Tartare here is a special dish worth ordering too! It comes with slices of crackers to pair with. 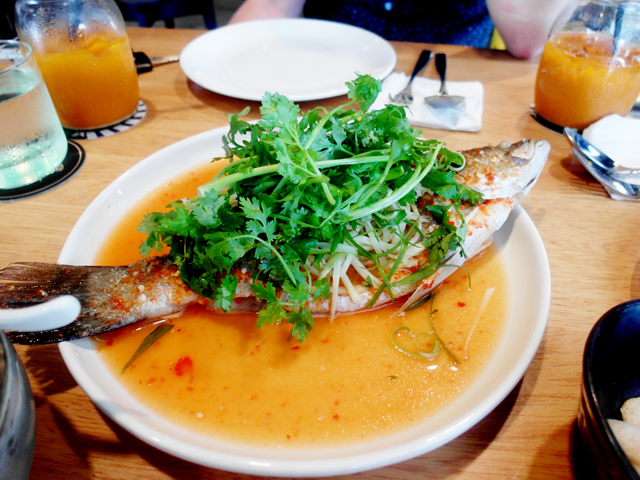 I've always liked thai-style steamed fish, so we also ordered the Steamed Seabass, which was meaty, fresh, and satisfying. 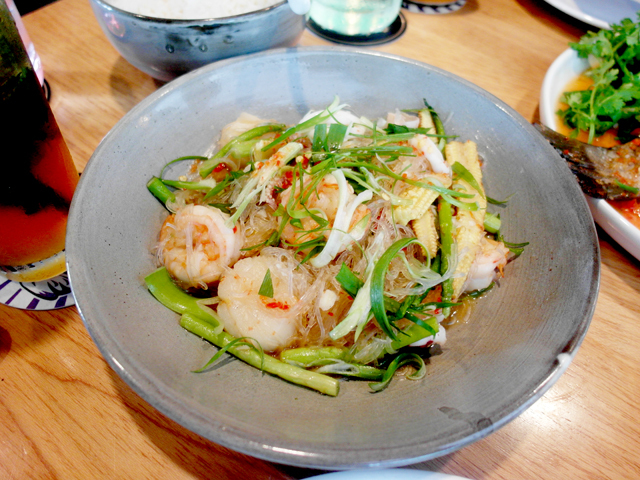 Specifically ordered the Mix Seafood too, because it has all the yummy seafood in it: scallop, prawn, squid, chili, lime leaf, glass noodles. Thumbs up for this one! Iberico Pork was recommended to us by the server, and although it doens't look very pretty, it was very delicious. The pork is slow cooked and very tender. So many good food I had a difficult time deciding which dish to focus on! 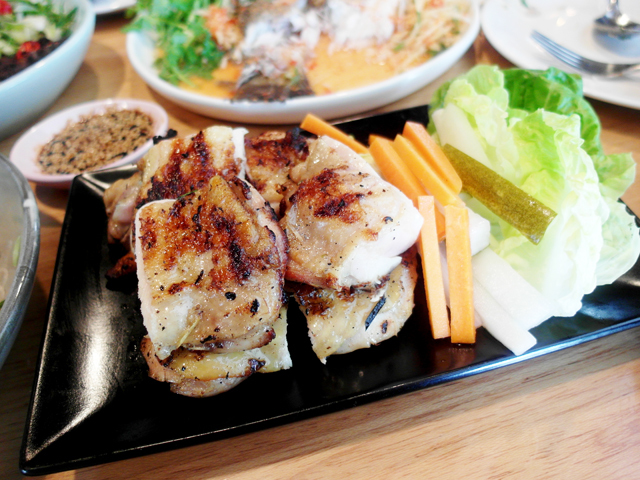 Moreover we also had the simple dish of Grilled Chicken which was very well flavoured and tender too. We were very full already and had a movie to catch but we decided to stay for dessert. After all the good food above, we were sure the desserts would be good too! 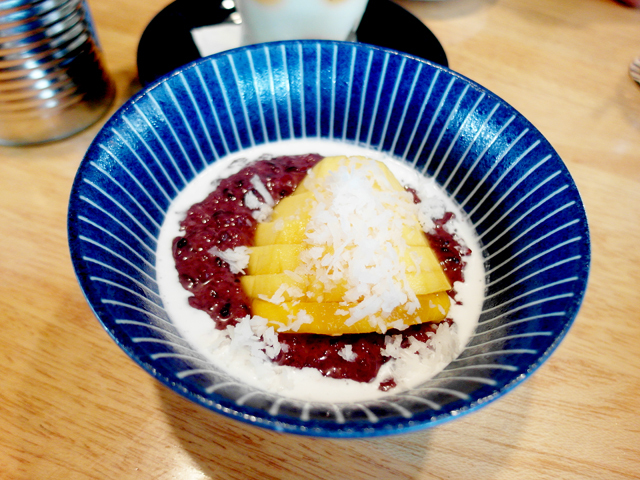 We were especially intrigued by this dish called "Black Sticky Rice" and at first, we thought it would be the traditional Mango Sticky Rice except black colored rice instead of white, but in the end it was a version of pulut hitam topped with mango. It was quite ok, I still prefer the traditional dry type of Mango Sticky Rice. 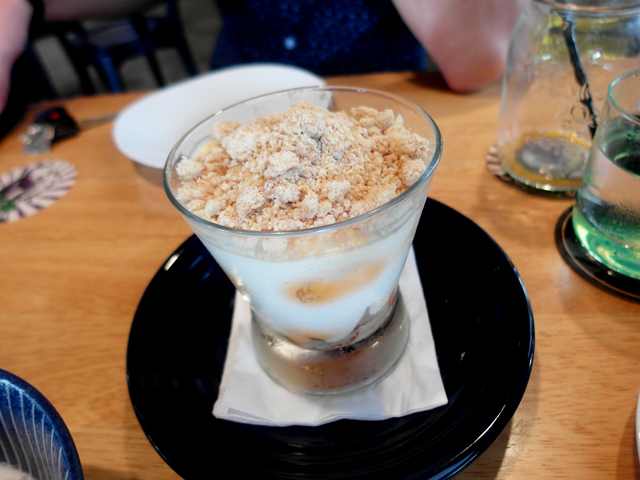 Next, we also had the Thai Tea Tiramisu. We actually weren't very interested in its plain look, but it turned out to be the better dessert of the two. 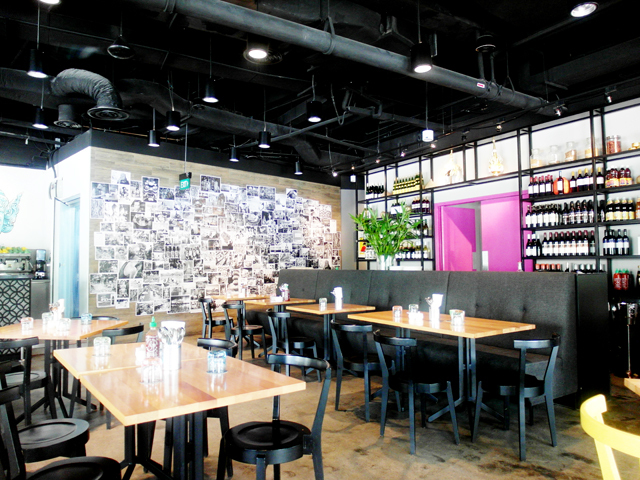 The restaurant is definitely worth the visit! Wearing a blue dress with swan prints I bought from Bangkok! 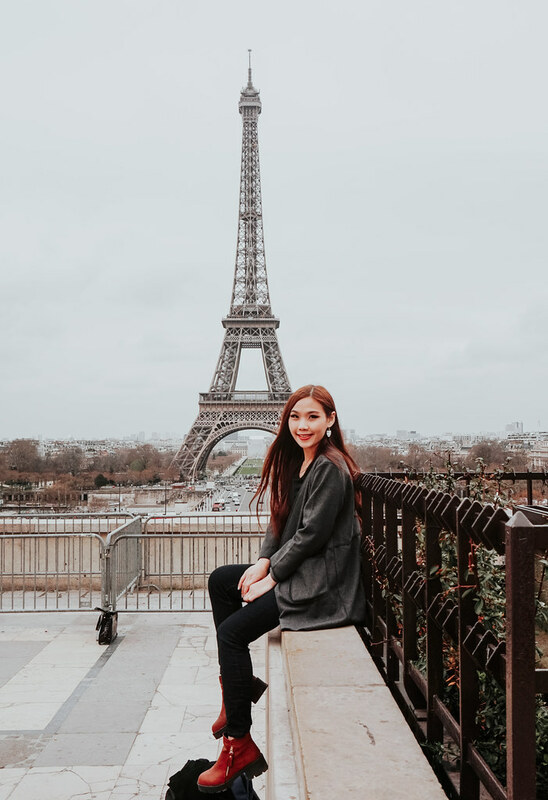 If you are wondering what happened to the movie that was supposed to be after lunch, I actually thought that we could make it since it's quite near. But bf keyed in the wrong address in his GPS and we went to opposite way!!! After we u-turn and made our way to the right direction, we were met with plenty of roadblocks due to NDP and we reached the cinema very very very late. In the end we decided to forfeit the tickets we had and rebought tickets for a later timing. All the rush for nothing!